Struck from 90% silver, the 2010 United States Mint America the Beautiful Quarters Silver Proof Set™ is the debut annual set to contain only the coins of the America the Beautiful Quarters Program. The America the Beautiful Program features quarter dollars with reverse designs emblematic of selected sites of national interest throughout the United States and its territories. Locations chosen as part of the program include national parks, national forest, national seashores, national monuments, etc. The coins in this Silver Proof Set mark the first through the fifth of the fifty-six coin program. Each coin is released in the order upon which the honored site came under the direct control of the federal government. Each coin is struck from 90% silver to proof quality and then encased in a protective lens. The case is then placed in an illustrated cardboard box for shipping to the customer. 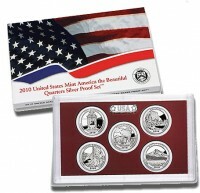 The 2010 Quarters Silver Proof Set was released by the Mint on May 27, 2010. The issue price on each Proof Set was $32.95. William Cousins slightly modified the John Flanagan portrait of George Washington found on the obverse (heads side) of each quarter dollar.